Museum of World Treasures: Summer Adventure Camp Registration, Now Open! Summer Adventure Camp Registration, Now Open! We are thrilled to announce that Summer Adventure Camp registration is now open! Give your kids or grand kids an opportunity to discover and explore by registering now for summer programs. Click HERE for a 2013 Camp Registration Form. Click HERE for a 2013 Camp Permission Form. Click HERE for helpful hints for happy parents! We have all new teachers and activities this summer, so there will be plenty of fun and educational learning for all ages, including previous campers. Also, for older children make sure to check out the new addition of Apprentice Adventure Camp offered in July. Adventure Camps are fun, four-day educational programs that take place in June and July. Each camp offers a morning session for children entering 1st-3rd grade and an afternoon session for children entering 4th-6th grade. The all-new Apprentice Adventure Camp is only offered for one week in July and is programmed for 6th-9th grade students. Cost for camp is $60 members/$75 non-members per child (+ tax). Each session’s minimum participant requirement for a camp to run is 5 children. If a camp should fail to register the minimum number, we will do our best to enroll your child in another session, or discount another program of your choosing. 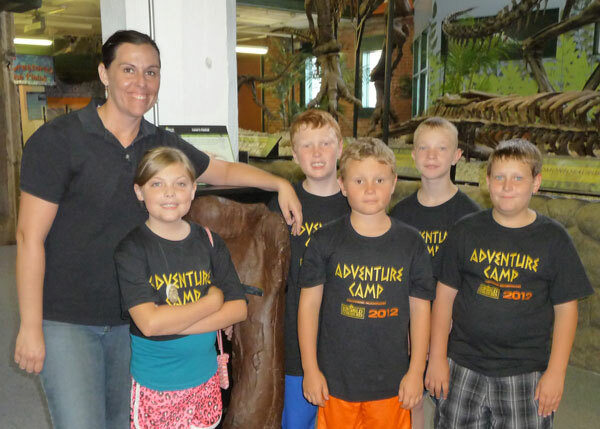 In June, sign up for Discovering Paleontology. In this camp, children will discover the Museum’s fossils in-depth, take home real fossils, enjoy paleo-themed games and learn how paleontology helps us understand the world. In July, sign up for Discovering the Ancient World. Campers registered for this program will discover the Museum’s ancient artifacts, learn about and participate in a mummification activity and enjoy ancient-themed games. Also, special in July, older children are encouraged to register for the all-new Apprentice Adventure Camp. For this one-week session, campers will learn about artifact handling, exhibit design and fabrication and giving tours. Create your own temporary exhibit with real Museum artifacts and invite friends and family to view the exhibit on display. Pre-registration and payment are required to reserve space. Our trained education staff is CPR/First Aid certified. Call 316.263.1311 or visit our website for more information.